Sounding the Waters: Is the Bay Area Prepared for Sea Level Rise? Sea level rise will irrevocably change life near the San Francisco Bay. That’s the premise of RISE: Climate Change and Coastal Communities, a documentary that starts airing this week on KQED Public Radio. Producer Claire Schoen sets the stage on a personal note. 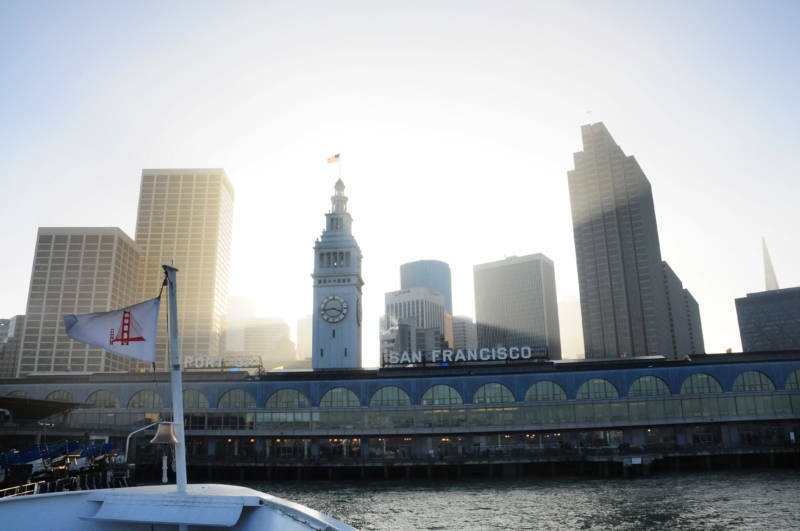 Climate scientists predict that sea level rise and extreme weather will cause severe, repeated flooding of San Francisco’s Financial District by 2050. “Mom, can you please can it with the climate change lecture – just for once,” my children complained. At ages 22 and 26, my politically correct, Berkeley-raised kids are well educated in all things scientific and political. But… “Enough already,” they cry. And I confess that their complaint has some validity: I can bring up the topic of climate change in pretty much any conversation. But really, what other topic is there? I do care deeply about war, immigration and famine. But all of these are affected by climate change which is a major cause of increasing drought, which in turn will create more and more wars to be fought over less and less arable land, pushing greater numbers of people to become environmental migrants the world over. This is not science fiction. And it is not the future. It is happening right now and it is being meticulously measured. The scariest part is that scientific estimates and predictions of the rate and intensity of climate change continue to be proven too low. It’s all happening bigger and faster than the models have shown. And it will get worse if we don’t radically slow our greenhouse gas emissions worldwide and figure out how to adapt to the impacts of climate change that are already too late to halt. The Mississippi and Missouri Rivers both experienced catastrophic floods this year, affecting cities and towns along both waterways. There were evacuations in Memphis. The Corps of Engineers was forced to breach levees on the Mississippi, intentionally flooding one area in order to save a more populated one. Chicago has experienced two intense storms classified as 100-year events – in the last three years. 14 states are experiencing one of the worst droughts in U.S. history. The entire state of Texas which is now in its 6th year of exceptional drought, has been designated a natural disaster area. Tropical storms in Vermont devastated inland towns. Since when is Vermont located in the tropics? While no specific weather event can be attributed to climate change, the pattern of increasingly extreme weather is exactly what climate scientists are predicting. So what does this mean for those of us living around the lovely San Francisco Bay? We have relentlessly filled in the edges of the Bay – 40% of it – transforming wetlands into real estate and then covering them with homes, shopping malls and industrial parks. Climate change threatens this land, once considered a 100-year flood plain, with flooding every 10 years, every year, perhaps every high tide, as rising sea levels and extreme rain, wind and waves come together to form a perfect storm – again and again. Upon embarking on the RISE project, my first act was to print out sections of a map of the Bay coastline, provided on the Pacific Institute website. It identifies those areas that are part of the 100 year flood zone. Pieced together, the map covers an entire wall of my studio. I quickly pinpointed my house. Whew – I’m safe. But not really, as my bank, airport, highway, sewage system and the houses of many of my friends are situated in the flood zone. Truly we are all in this boat, together. Will Travis, of the Bay Conservation and Development Commission provocatively suggests that what we need to build today are not houses, but campgrounds. Our stay at the edge of the rising tide is a temporary one. Yet, foolish animals that we are, we make big plans, instead, to develop entire new communities, the Redwood City Saltworks and Treasure Island, both sitting at sea level. Today’s sea level. So, if not campgrounds, then what? The hard truth is that we don’t know what to do. But it’s time to come together to figure it out. To this end, I’m going to keep talking. Cause kids…it’s all about climate change. Part 1 of RISE, entitled “Sounding the Waters,” airs on KQED 88.5 FM on Thursday, December 8, at 8 pm. Parts 2 and 3 air January 12 and February 9, respectively. Will this be available on kqed.org after tonight. I may have to miss it. I have always thought the plans for Treasure Island were yet another folly. Your list of “record-breaking numbers” of “record-breaking” weather events are not out of the ordinary climatic events. Our records are very short…many, many only going back to the latest 1970s. Climat4e cycles are generally much longer than the 30 to 40 years for which we have actual data. There may well be several other reasons for the impacts from these events, other than climatic…primarily population growth and all of its ancillary effects (pavement that increases runoff and decreases sediment which increases th mimpact fo natural subsidence, urban heat, groundwater extraction leading to “un-natural” subsidence). Please do not drink the kool aid from either side. Please look at long range temperature changes…like for the last 2 million years when earth entered the Pleisotcene and its distinctive clamate pattern. Climate change happens…always has, always will. The evidence for increased carbon dioxide being the trigger is specious at best. Most of the catastrophists base their concerns on models, not facts. The standard joke when modeling is “what do you want the answer to be”! Climate models are rife with WAG assumptions and often don’t even include primary drivers (e.g., clouds!). All in all, the author should pay attention to the kids! It is certainly true that there have been very wide shifts in the planet’s climate over the millennia. What is unique is the incredible speed at which the climate is changing today. For example, we are seeing massive melting of the icecaps over the last hundred years, which is actually happening at a rate far faster than even the worst-case scenarios of just a decade ago. This is in contrast to earlier changes which took thousands of years. It is not at all clear that natural systems can adapt quickly enough to today’s rate of change. Not true…nothing incredible about the speed. The hockey stick scenario has clearly been debunked. “Massive melting” of the icecaps is based on 30 or so years of actual records…and remember, only the Artic icecap is shrinking. Antarctic is growing…historical documenttion (news reports from the past) clearly indicate opening of the norhtwest passage. It’s happened before in relatively recent time. The Arctic icecap “melting” being talked about is based on records that start in 1979! Always ask/look for the period of record. You’ll be surprised. I encourage you to take up your concerns with the 97 percent of climate scientists who agree on the tenets of anthropogenic, or human-caused, climate change. (July 2010 NAS Report). Then you might want to talk to the official academies of the U.S., Australia, Belgium, Brazil, Canada, China, France, Germany, India, Japan, Mexico, Russia, and the United Kingdom who have independently published concurring conclusions. Then maybe you can convince Richard Muller that he got his independent study wrong, too. Look at some of the data yourself, rather than depending on those with other motives. Look at the time periods for which the climate expert’s models and records depend. Then dig around a little and find similar records for longer periods of time and compare them to the periods the experts use. You may be surprised. I am a scientist…admittedly not a “climate scientist” but a geologist who has looked at climate and sea level change issues over the millenium as they relate to global tectonics, the opening/closing of oceanic basins and resultant changes in the “conveyor belt”, volcanic emissions, etc. for 30 some years. Are you aware that sea levels around the world have risen on the order of 100 m since the end of the last glacial period (+/- 15,000 years ago), and have risen and continue to rise at a pretty consistent rate for the last 6,000 years or so? Look into the inundation history of our wonderful San Francisco Bay…the notorious Bay Mud that rims it. One thing you will notice it that our planet is in a nice 15k to 20k year long warm period called an interglacial period. These warm periods, separated by much longer glacial periods, have occurred pretty regularly on an approximate 120k to 140k year cycle and has cycled through this broadly glacial epoch for the last 2 millions years. The point in time at which this cycling commenced marks the start of the Pliestocene Epoch (aka, the Ice Age). Our most recent, our nice little warm period, the most recent interglacial period, started about 12k to 15k years ago and has been defined as the Holocene (aka, Recent) Epoch. There is no reason to think that the overall 120k to 150k Pleistocene cycle is ready to change. The next glacial period, when it comes, will be disasterous for humankind as we know it today. Cold dry climates are much worse for we naked little buggers than warm wet climates. In the cold, the carrying capacity of the planet is sharply decreased and the human popluation will be greatly impacted. I am also well aware that previous bands of experts have frequently been found to be egregiosly incorrect…blindly following the dogma of the day…facts be damned. History is full of stories where the vast majority of experts were clearly wrong…locked in their own paradigm of self interest. In my geologic world history, Alfred Wegenger and his well-documented scientific theory of continental drift was mocked by the geologic experts of the day (1912). How dare a meteorologist tell us learned experts such a preposterous thing! Harrump! Why nobody in their right mind would believe such a thing! By the 1950s and finally in the mid-60s, his theory became a critical part of the now, well established, plate tectonic theory. Curiously, I also consider myself a progressive. I love NPR, PBS, etc. I am really troubled that that my perception of these data are in-line with the spew form the nut-jobs on the right that disagree for their own politcal and social reasons. I am truly troubled that the environmental movement is being guided by purely political motives, eschewing sound science. I am truly concerned that the environmental movement has hitched its wagon to a dogma that will be shown to be false and the movements credibility will be damaged for a generation or more. Please, be skeptical of everything that is being said…both sides of this issue! Remember the bumper sticker of the 60s…”Question Authority”? Please do. James, thank you. We really appreciate thoughtful, candid comments like this, and you’re absolutely right — at least about viewing the science with a healthy skepticism. Any credible climate scientist will concede that there are wide bands of uncertainty around much of these projections. Richard Alley of Penn State noted in a San Francisco appearance last week that projections for sea level rise by the end of the century range from about a foot, to nine feet and beyond. Stanford’s Chris Field, co-chair of the IPCC’s Working Group 2, told us before this week’s meeting in San Francisco, that the science gives us a “blurry picture of the future,” but with enough sharpness to make some important decisions. It would seem that with all its blurry imprecision, the preponderance of the evidence indicates that doing nothing is a poor option. The question is, which actions to take.